I am a dress fiend, yes I AM, I love them, I love to swish, I love their simplicity, I love that you just whack one on and da-dah! You have an outfit. So here we have it, another potential regular but this time I’m introducing some awesome frocks. I’m also introducing a brilliant little online shop, Clarence and Alabama. Now I have to come clean, Amy-Jo who runs this fine emporium is a very good friend of mine but I wouldn’t share with you just any old shizzle. Her shizzle, her beautiful vintage style dresses, are handpicked stunners. And not only are they beautiful they are also affordable too so go check out her wonder shop. 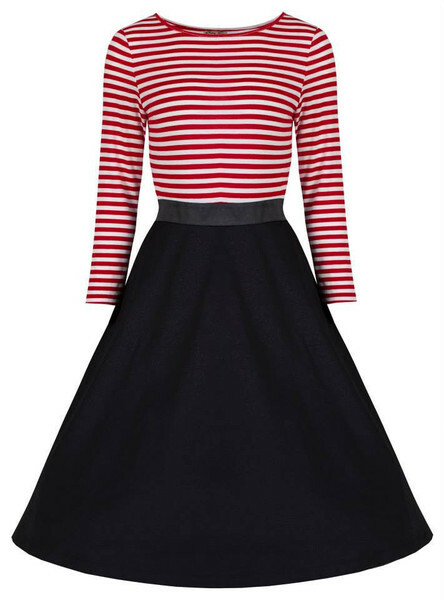 This this chic, French inspired little number is a Lindybop dress called the Josefine Vinatage Style Breton Top 1950s Swing Dress and is priced at a very reasonable £34.99. Personally I think it’s just perfect for flouncing around doing just about anything with or without a baguette under your arm, sorry for the hideous stereotyping there. This second beauty is actually currently sold out, but I couldn’t not show it as I have had my heart set on it for quite some time. However the good news is she is bringing it back, oh yeah, and if you follow this smart little shop owner on Facebook or email her here you can even request a choice of material and have the god darn delicious dress made to your special requests. In fact that’s not all this fantastic little shop offers, if you happen to be getting married and are after some vintage style matching bridesmaid dresses she can do that too. So what do you think? Any thoughts? Got any recommendations of great dress shops or dresses out at the moment? I do love these dresses!